Swimming Grass Snake. After spotting me, the Grass snake swam to the nearest vegetation for cover. 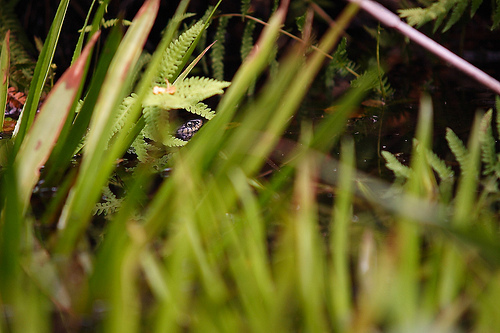 Grass Snake hiding in vegetation. By putting the head (and most noticable, the eye) of the Grass snake on a strong photographic point (rule of thirds) and by using a shallow DOF, the snake really pops out in this shot. 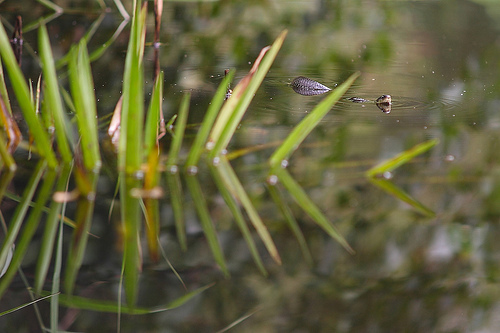 Swimming Grass Snake in between the Water Soldier. After seeing my first Grass snakes in the Weerribben, I wondered how I would get a nice shot of one. Preferrably swimming towards me, nice flat water. That would be nice... This snake must have read my mind!